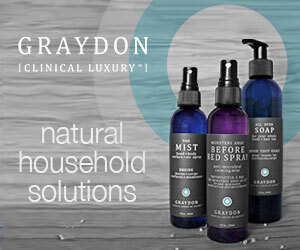 My goal at this year’s Eco-Beauty Market was to check out some products that I’d heard great things about (like Clinical Luxury by Graydon! 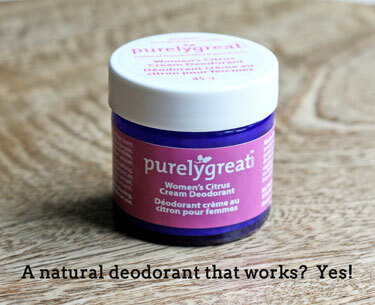 ), and also try and find an effective, natural deodorant once and for all. Of all the non-toxic success I’ve had, despite not being an overly sweaty person I’ve yet to find a deodorant that doesn’t leaving me stinky within a few hours hours… Until now. I have been following this ultra-clean line through social media, but hadn’t had the opportunity to actually touch and play with the products in person yet. Well, I wasn’t disappointed! I picked up her Green Cream, Skin Stuff, Face Food Mineral Mist, The Cleanser, and All Over Soap + Shampoo. 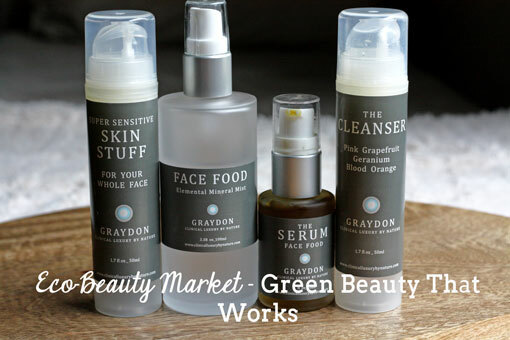 This product line is really reasonably priced for what it is - more expensive than the cheapo drug store brand stuff, but less expensive that the higher end department store products. If you want to find out more, check her out online. You can even make purchases through her website. Switching out all my personal care products to non-toxic varieties has been a relatively painless process, except where deodorant is concerned. In 5 years I have never found one that actually works, and I’m not a particularly sweaty person. I’m not opposed to the idea of reapplying, or even needing to wipe my pits out to really freshen up before reapplying and going out, but I do need something that works for longer than 2 hours. Enter Purely Great. This deodorant cream has 3 ingredients, contains no aluminum, and actually works. And I mean WORKS – all day, all night, and through a sweaty morning workout the next day. Check them out for yourself. I first met and tried Jaydancin a year ago after being their booth neighbour at a show. I picked up some of their soaps and really liked them. The smell was great, not overpowering at all, and it left my skin feeling soft and nourished. When I saw them at the market I didn’t hesitate to buy some more, and I also picked up a travel size of their Deep Relief, which can be used for muscle pain, headaches, and achy joints amongst other things. Hubby suffers from chronic shoulder pain and I can get tense shoulders. It works really well for our muscle pain – kind of like the products that heat up and also feel cold, but without all the toxic gunk in them. You can order from them online. 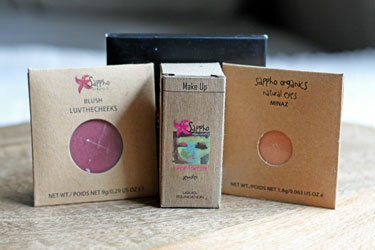 I don’t wear makeup very much, so truthfully, switching to non-toxic products hasn’t been high up on my priority list. Having said that, for the 2-3 times per year that I put some on, using my old department store brand stuff hasn’t felt good. I don’t like the way it feels on my skin, and I don’t like the way that it weighs on my psyche. I’ve heard about Sappho and was really excited to talk to them. They colour matched my skin to find the perfect foundation, and it feels so good to wear! I nabbed a blush and an eye shadow as well, and I think I’ll slowly start building my collection using more of their products. Check them out online. It’s hard to believe that after having so little success with natural deodorants for so long that I could actually find two that work in the same day! 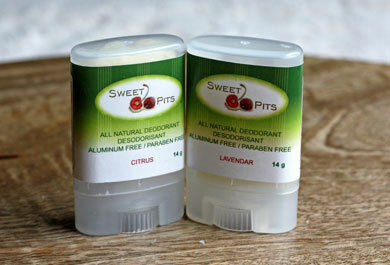 Sweet Pits uses a few of the same ingredients as Purely Great, but also adds things like Shea Butter and Cocoa Butter which lets them create a product that can be dispensed from the more familiar stick format. I’m using it the same way as my Purely Great and having the same level of success! Again, check them out online for more information about how and where to purchase. The best way to start making the switch to more non-toxic personal care is to start reading labels, becoming more aware, and just basically to try new things. Many companies offer smaller, sample sizes of their products and are more than happy to help you find a suitable product for your needs. Just send them an e-mail or call them. Choosing cleaner body care doesn’t mean you need to give up good quality, luxurious feeling products, and you certainly don’t need to give up looking good!